To give you a taste of the book, here are a few passages that stood out to me as I read chapter 8 today. The chapter is about the indwelling and empowering on the Holy Spirit in the life of a believer. Because the Lord Jesus died on the cross, I have received forgiveness of sins; because the Lord Jesus rose from the dead, I have received new life; because the Lord Jesus has been exalted to the right hand of the Father, I have received the outpoured Spirit. All is because of Him; nothing is because of me. Remission of sins is not based on human merit, but on the Lord’s crucifixion; regeneration is not based on human merit, but on the Lord’s resurrection; and the enduement of the Spirit is not based on human merit, but on the Lord’s exaltation. The Holy Spirit has not been poured out on you and me to prove how great we are, but to prove the greatness of the Son of God. Some time ago a young man, who had only been a Christian for five weeks and who had formerly been violently opposed to the Gospel, attended a series of meetings which I was addressing in Shanghai. At the close of one in which I was speaking on the above lines [Acts 2:32-36], he went home and began to pray earnestly, “Lord, I do want the power of the Holy Spirit. Seeing Thou hast now been glorified, wilt Thou not now pour out Thy Spirit upon me?” Then he corrected himself: “Oh no, Lord, that’s all wrong!” and began to pray again, “Lord Jesus, we are in a life-partnership, Thou and I, and the Father has promised us two things—glory for Thee and the Spirit for me. Thou, Lord hast received they glory; therefore it is unthinkable that I have not received the Spirit. Lord, I praise Thee! Thou hast already received the glory, and I have already received the Spirit.” From that day the power of the Spirit was consciously upon him. As soon as we see the Lord Jesus on the cross, we know our sins are forgiven; and as soon as we see the Lord Jesus on the throne, we know the Holy Spirit has been poured out upon us. The basis upon which we receive the enduement of the Holy Spirit is not our praying and fasting and waiting, but the exaltation of Christ. Those who emphasize tarrying and hold “tarrying meetings” only mislead us, for the gift is not for the “favored few” but for all, because it is not given on the ground of what we are at all, but of what Christ is. In the same way, you can pray and wait for years and never experience the Spirit’s power; but when you cease to plead with the Lord to pour out His Spirit upon you, and when instead you trustfully praise Him that the Spirit has been poured out because the Lord Jesus has been glorified, you will find that your problem is solved. Praise God! It is wonderful to know that my relationship with God does not depend on my ability. Rather, the benefits He has promised are mine because of His faithfulness. This is the first Watchman Nee book that I’ve read (as far as I remember). I have been pleased with his ability to explain things in a simple manner. 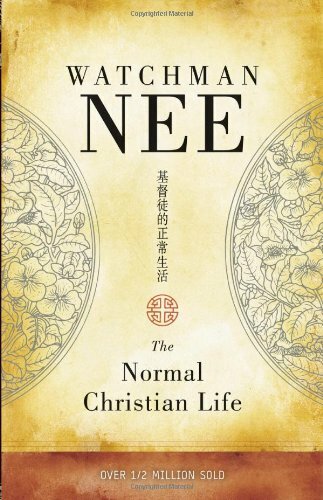 You can find many more Watchman Nee titles at the Amazon author page for him. I am attending the Our Generation Summit that is hosted by Vision Baptist Missions. The sessions are all focused on missions. I attended a session title “Introduction to Creative Access Countries” and gained some insight into this that I want to share. creative access country is also known as a closed country, limited access nation, restricted access nation, and various other names. Primarily the term refers to countries that do not allow missionaries to come into their country as a missionary, but may let the missionary enter through some other means. Usually this is through being a businessman or teacher. These are countries that are primarily Muslim, Hindu, Buddhist or Communist. The missionary, who works in North Africa, talked about various ways missionaries get into these countries legally and how they stay. He mainly focused on the effectiveness of the creative ways we get into these nations. Many of these countries can be entered by being a businessman or teacher. But much of the time–certainly not always–missionaries go in these capacities and don’t fulfill the work for which they are called. He did not say it is wrong to use these methods. In fact, he is in the country he serves by being a businessman. However, it is also easy to get wrapped up in the work for which you legally get your visa and not actually do the work of the ministry. He said that only about 5% of missionaries who go in a tent-making capacity to a field are actually involved in church planting. Yet, 80% of them are supported by churches for the purpose of winning souls, making disciples, and planting churches. Many missionaries get caught up in the day-to-day work that they think they have to do to justify being in the country without doing the work for which they were sent. Certainly there is nothing wrong with being a businessman or a teacher and working in another country for the purpose of evangelism. But if you are a missionary, then your focus should be on missions and not only your business. Here are his sub-points under his topic of why many missionaries have a problems staying on track when entering the field as businessmen. I know that some may disagree with a few of these points, that’s between you and the missionary I got this from. I simply share what I thought was some good material. We think the goal is to stay in the country. Yet the goal should be to win souls, make disciples, and establish churches. Keep that as your focus and then figure out the other in light of that. Don’t make the sole goal of your work to stay in the country. We ought to obey God rather than men. Obey Him first, then let Him help you work out the details of how to do it. Does your access to the country require that you spend 40+ hours a week in a job? When do you have time for winning and discipling people and establishing local churches? You don’t need to be dishonest in your reason for being in the country, but that also (often) does not mean you have to work 40 hours a week in your job. In this brother’s case, he has started a business and employs others to actually do the work. He spends 30 minutes a month managing the business and even pays taxes on what the business makes. But, he admits that the business isn’t the most successful. No one said you had to be a successful businessman to get a visa. Many who go with the idea of being a businessman or teacher train for that job and ignore their ministry training. Again, you don’t have to be the most successful businessman, but if you are taking mission money from churches you ought to be a well-trained missionary. In these closed countries, it is easier to teach English than it is to make disciples. Most of us want to invest time in the endeavor that is easier and more successful. Don’t get wrapped up in thinking a booming business is the reason you are in the country. The people you reach will learn that it is good to be a good worker and avoid conflict with the government. Western Christians like us think that it is horrible to suffer persecution. Yet, we know that God’s grace and presence is most evident when there is persecution. God is glorified and His Word is spread in a powerful way when persecution is present. A rich American businessman is hard-pressed to preach to people–who may lose their lives for conversion–that suffering for the Lord is a worthy price to pay. The work of missions desperately needs these types of ministers. The work on the field needs these men and women more than it needs a new coffee shop. Paul identified himself as a servant and apostle for the work of the Gospel. He did not identify himself as a tent maker. Did he make tents? Yes, but that was not his identity. And, apparently he did not engage in the work of making tents enough to make it part of his identity. It was something he did. But who he was was a missionary. Don’t hide the need of pastors and other ministry workers from the people on the field. They ought to see an example of soul winning, training others, and establishment of local congregations. Paul suffered persecution. The people knew it. How do people know the missionary engaged in teaching English? If it is simply as an English teacher who happens to know the Lord, then I think we have missed being the example that Paul is to us. A survey of national Christians in some of these countries asked what the nationals learned from the missionary. The number one answer was: we learned how to be afraid. Oh please, don’t let that be our legacy on the field! A full-time, church planting ministry may not be possible in every country, but church planting is biblical and necessary. Use creative ways to get into the country, but don’t make that your sole purpose and focus when you go to the field. I know there are people I would otherwise agree with who don’t think that the biblical account of creation is accurate. They may be good, moral people. Many are even Christians. However, I think to dismiss God’s account of His creation establishes a shaky foundation for the rest of your faith. For whether we live, we live unto the Lord; and whether we die, we die unto the Lord: whether we live therefore, or die, we are the Lord’s. Believing in creation as told in the Bible establishes that God is the ruler, owner and authority in His creation. It is God who has ultimate control over the world. We are not subject to “mother nature.” We are subject to the laws of God’s design. God has given man responsibilities in relationship to His creation. The philosophy of the world says that there is no authority over us. We live to ourselves. We die to ourselves (Romans 14:7, 8). The world does not like the thought of being answerable to a higher authority. If you believe in creation as told in the Bible, then you create a conflict between yourself and the philosophy of the world. Man is subject to the authority of God. But when you read the creation account in Genesis 1-3, you see that man did not want to recognize God’s authority. I remember when I was younger, thinking that I should not be punished because of the choices of Adam. If I had been put in a perfect environment and had a physical, personal relationship with God, there is no way I would have made the same choice that Adam and Eve did. But the truth is that even after being a Christian for 30 years and having the Holy Spirit indwelling me, I still struggle with sin. Romans 6 teaches me that I am no longer under the control of sin, yet I choose to obey the temptations of the world, the flesh, and the devil. Because of Adam’s sin, the creation of God has been cursed (Romans 5:12). Even evolutionists should be able to see the results of the curse. Throughout recorded history and the nature of the curse on creation, we observe that things tend toward chaos and disorder (or more properly stated, toward energy dispersal). However, in the one single area of biological evolution, the second law of thermodynamics is ignored. In observable (real) science, things never evolve from a poorer state to a better state. They always devolve from a better state to a poorer state. The philosophy of the world does not want to recognize that man is a fallen creature because of his sin. This is the basis of many religions. And I agree that Christianity is a belief system that can be seen as just another religion. However, a Christian belief in creation and the origin of sin is not at all contradictory with the rest of what we read in the Bible. Nor is it contradictory with observable science. Why Is Biblical Creation Important? If you say you believe God and the Bible, but you choose to say that the first 6 chapters of the Bible aren’t accurate, then how can you believe the rest of the book? You may not see it as all that critical to your personal faith, but what about your children? Will they see your faith as contradictory? You teach them that the Bible is true and complete. Yet, in this one area, you say that it is OK to not have to believe what God told about His own creation. Either the Bible is completely true, or you can’t trust the accuracy of it in anything it says. You would then have to start questioning other parts of the Bible. You become your own authority over what God claims is truth. That is exactly why we have so many religions in the world today. If you need some encouragement as to why this is such an important topic, I suggest you read Ken Ham’s book, The Lie. There are many other books by him and the folks at Answers in Genesis that will be a help as you study this important topic. Previously we saw the negative example of sowing and reaping in the life of David. The life of Ruth is a positive example of this biblical principle. The whole story of the book of Ruth is worth reading. It is only four chapters long and would only take you about 20 minutes to read it. If you are not familiar with the story you are welcome to step away from the computer for a bit and get caught up. I promise, I will wait for you. If you prefer to read it online, one of my favorite sites for reading Bible texts is BibleGateway. Though Naomi and her family were Israelites, they were living in the country of Moab. Ruth married one of Naomi’s sons. Later Naomi’s husband and two sons died while they were still in Moab. This left Naomi in a foreign land with two daughters-in-law and no extended family support. She decided to return home to Israel. After hearing these words, how could Naomi refuse to let the young Ruth travel back to Israel with her? Ruth knew that God’s law had said that when a field was harvested the corners should be left for the poor and for strangers (Leviticus 19:9, 10). Ruth told her mother-in-law that she would go to the harvest field and gather grain (Ruth 2:2). Several things in the text like this indicate that Ruth was probably a student of Hebrew culture and law. Even though she had every right to be there gathering from the corners of the field, Ruth was not presumptuous. She asked the workers of the field for permission to gather grain (Ruth 2:7). While speaking to the workers of the field, she met the owner. His name was Boaz. He was very kind to her and told her not to go to any other field to harvest grain. She was welcome to stay in Boaz’ fields. He also invited her to drink from the water that his workers had available. Boaz commanded that his workers treat her kindly and not to harm her in any way. Boaz, before the inevitable romance began, was more than kind and generous to Ruth. It hath fully been shewed me, all that thou hast done unto thy mother in law since the death of thine husband: and how thou hast left thy father and thy mother, and the land of thy nativity, and art come unto a people which thou knewest not heretofore. Ruth fell to her face and thanked Boaz for his kindness. She then asked why he was so gracious to her. She was a stranger from another country. He had no obligation to her other than to fulfill the law (Ruth 2:10). And this is where the law of the harvest comes in. Ruth reaped what she had sown, more than she had sown, later than she had sown and in proportion to what she had sown. We find out later in the story that Boaz is related to Naomi, Ruth’s mother-in-law. Because of this, Boaz knew that Ruth had abandoned her homeland so that she could care for Naomi. Ruth had sown kindness and care to Naomi. Beyond that, Boaz said, he knew that she had trusted in the God of Israel (Ruth 2:12). Boaz said that God was rewarding Ruth for everything that she had done in showing kindness to her mother-in-law. Then Boaz invited her to eat with the workers. She sat with the reapers and ate their food. She had already been given water to drink. Boaz commanded the workers to allow her to work in the main part of the field to gather some of the best grain. The workers were even told to do the hard work of the harvest and allow some to “accidently” fall so that Ruth wouldn’t have to work so hard (Ruth 2:16). In the end Ruth and Boaz fall in love (who didn’t see that coming?). Ruth, a woman brought to Israel from another country, became the great grandmother of King David. God blessed this young lady who had sown kindness and faithfulness in the small way that she could by making her an ancestor to the Lion of the Tribe of Judah—Jesus Christ. Recently I preached about the concept of sowing and reaping in our church. This is the basic theme of my Sunday morning preaching for the next couple of weeks. You reap more than you sow. You reap later than you sow. You reap in proportion to what you sow. Today we looked at David’s sin against Uriah and Bathsheba. We saw how David experienced the law of sowing and reaping in the life of his family. You would be well served to read the whole story contained in 2 Samuel 11-12, but here is a quick summary. King David sent his troops to war. He stayed home and committed adultery with Bathsheba, who was the wife of one of his mighty men of valor named Uriah. When Bathsheba found out she was pregnant with the king’s child, she sent a message to him to let him know. King David was distraught that his sin would be found out, so he put into motion a plan that he hoped would cover his wrong actions. David called Uriah from the battlefield to give the soldier an opportunity to spend time with his wife. Then people would assume that the baby was his. But Uriah could not bring himself to go home to his wife when his friends were fighting on the battlefield. He slept at the king’s door. When David discovered this he called Uriah back to him. David caused Uriah to get drunk and then sent him home again to be with his wife. Uriah still refused to go home. David then sent a message back to Joab, the captain of the army, instructing that Joab put Uriah at the front of the hottest battle and then pull the troops back so that Uriah would fight alone and be killed. Imagine Joab’s surprise when he read the letter from David which was delivered by Uriah! Yet, Joab obeyed and he later sent a message back to David that the deed was done—Uriah was dead. God sent Nathan the prophet to tell a story to David. Though David may have liked a good story on occasion and probably used to enjoy the company of the prophet, he assuredly felt awkward as Nathan told him the story of two men, a traveler and a lamb. David thought he had hidden his sin. We know that this story was told to David after the baby was born. So at least 9 months had passed from his initial sin until he was confronted by Nathan. The Bible does not say how much time passed, but it could have been more than a year that David had been living with his guilt. Nathan told the story of a rich man who had many sheep and a poor man with only one lamb. This lamb was a family pet. A traveler came to the house of the rich man. The rich man seemed to have no guilt in taking the poor man’s lamb from the family and butchering it for a feast. With David’s righteous indignation hanging in the air between him and the prophet, Nathan delivered the judgment to David that the king was the rich man guilty of slaying the beloved lamb. The truth of David’s sin and the fact that he had not hidden it like he had hoped, came crashing down on him. God knew that David had stolen someone else’s bride even though he had many wives of his own. There would be consequences for the sins of David. He was forgiven. God was merciful. But there would still be consequences. A person may sin in a way that causes physical damage. God can forgive the person, but that does not mean they will be wholly restored. This happened in the life of David. He was forgiven, but still suffered consequences for his actions. Nathan told David that God would be merciful on him and that David would not die. But there would be consequences in the life of the king and his family. One of which was that the newly born child would die. Nathan left from speaking with the king and the child became ill. The king’s son was sick for a week until he died. David had fasted and prayed for the life of the child. Though David had been forgiven by God, there were still devastating results because of his sin. Beyond the death of the child, God said that David’s sin would result in public consequences. People would know of the sin of David. There would be war. The people of Israel would have no rest. David’s wives would be taken. Evil would come from within the house of David. This is where David reaped what he had sown. Even though he was forgiven, he could not turn back the law of sowing and reaping. The adultery, lying and murder that David committed carried consequences. The sowing of the king resulted in a harvest. David’s children mimicked the behavior of their father. This is not to say that all children will be wicked because their parents are wicked. However, it is true that our children learn much of their behavior from their parents. We know that Solomon was a good man and a good king. Yet he was born and grew up in the house of a changed man. David was not the same father to Solomon that he had been with his older children. I believe David learned from his mistakes. You also are not condemned to act out the harvest of your parents. You and I have a choice to allow the Holy Spirit to take control of our life and sow a good harvest. With the Holy Spirit’s guidance we can sow well and reap a wonderful, godly harvest.